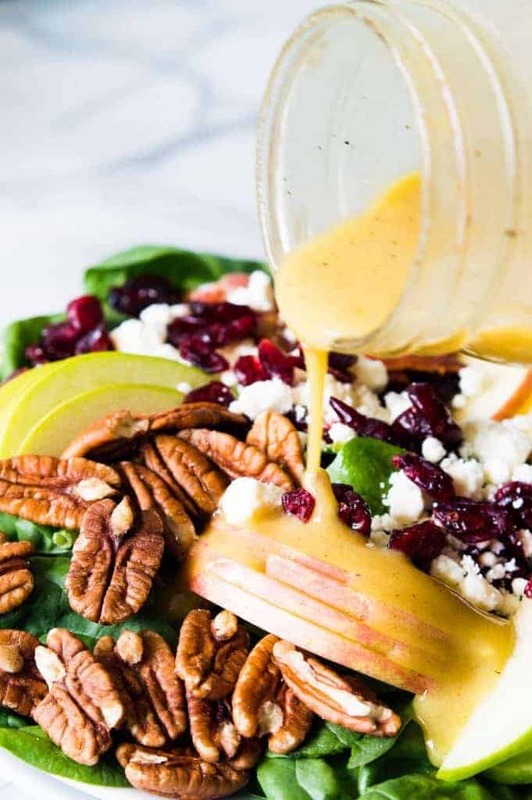 Autumn Apple Salad with a Maple Vinaigrette will let you celebrate all the flavors of Fall! 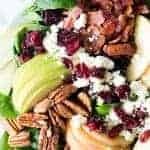 Pecans, cranberries, apples, feta and baby spinach all drizzled with an easy to make maple dijon vinaigrette! There is nothing better than sitting down to a fully loaded salad! 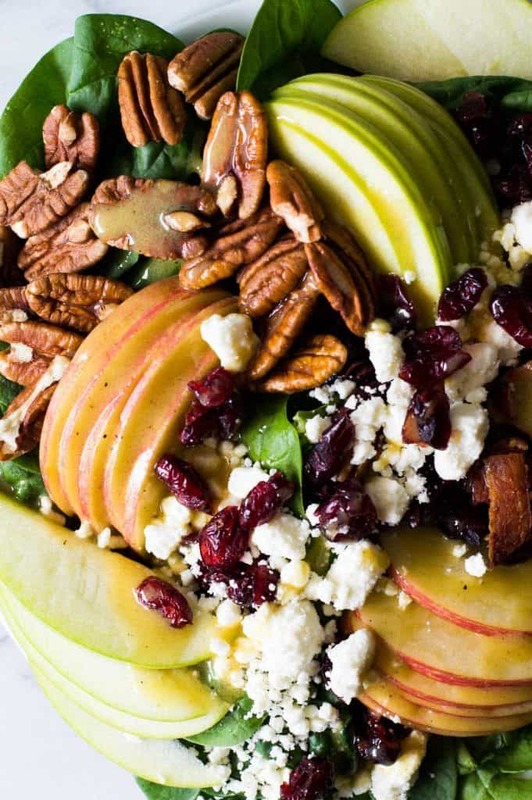 And this Autumn Apple Salad is loaded up with tons of flavors and textures. It is sure to become a new favorite. Trust me. This salad is loaded up with all the best fall flavors. Two kinds of apples. Granny Smith and Fuji. To give a sweet and tart flavor. Plus we’re going to drizzle this apple salad with some flavorful Maple Dijon Vinaigrette. 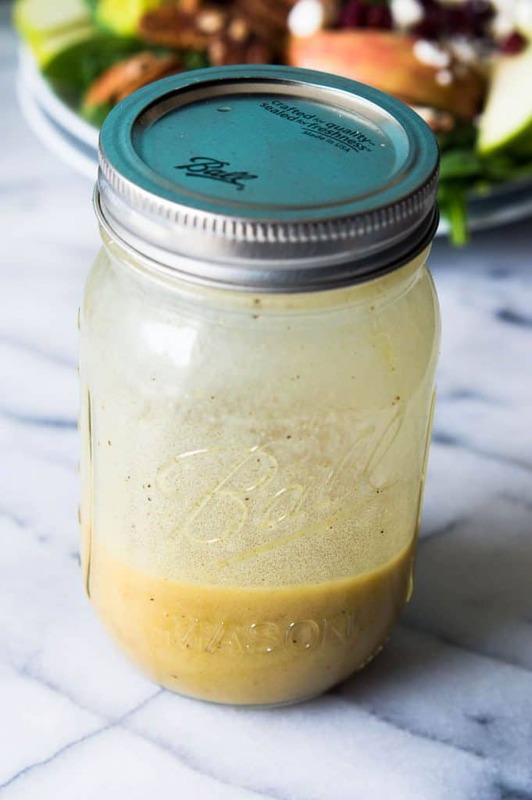 The dressing is made of ingredients you most likely have in your pantry: extra virgin olive oil, maple syrup, apple cider vinegar, dijon and salt and pepper in there. This has become one of my all time favorite salad dressings and I make this to drizzle on most of my salads now. The best way to make the dressing is to use a small jar. 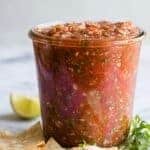 This way you can close the lid, give a little shake, and mix it up completely. This apple salad is the perfect dish to bring to any potluck or party. 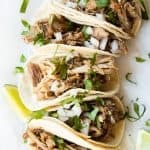 There’s so many comments below of readers who have made this to bring to a holiday dinner only to have this be the first dish completely finished off. It always gets rave reviews, and everyone will be asking for the recipe. WANT TO TRY THIS AUTUMN APPLE SALD WITH MAPLE VINAIGRETTE?? PIN IT to your SALAD or HEALTHY EATING board TO SAVE FOR LATER! Maple Vinaigrette recipe adapted from Martha Stewart. 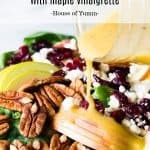 Quick question, I am so interested in making this salad to serve to my family on Thanksgiving, but I have not been one who has “branched” out to try cheese ie feta. Do you have suggestions of what other type of “normal”ish type of cheese, or should I just omit the cheese all together? Love this autumn salad! I have made four times and will keep on making it while I have a good apple supply. love the bacon on it. Also found some Burnt Sugar Pecans at store and they really make this a special salad. 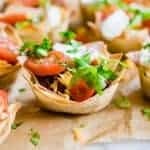 You will impress your guests with this salad! Thank you! Those burnt sugar pecans sound amazing!! I need to go find some of those. And I’m so glad you enjoyed the salad 🙂 It’s one of our favorites too! I am interested in making this for a larger group too…is there a converted recipe for a bigger serving size? The recipe will comfortably feed one person having this salad as a meal. If you’re looking to have it as a side salad it could probably feed about 3. How many people are you needing to feed? Just multiply the ingredients to make a larger batch. The most important thing is to make sure there is enough dressing. So if you need it for 10 people, just multiply the ingredients by 10. Hope that helps! I want to make this for Thanksgiving! Some of my family members do not like a spinach salad. 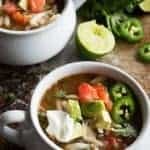 Would a mix of spinach and romaine work in this recipe? I making this salad for my family’s Thanksgiving tonight, with a couple of tweaks. I am using goat cheese, and I candied the pecans using bacon fat, brown sugar and a smudge of cayenne. Thanks for the inspiration! I made this for Thanksgiving had to quadruple the recipe because my lovely family are pigs! I did 1/2 spinach and romaine it was delicious! I can honestly say it is the first time I have ever seen people fight over salad. Haha! So good! My 4 year old even kept asking for more spinach, and that’s saying a lot. The vinaigrette was delish. Will definitely keep this recipe in the box. Yay!! Love finding healthy foods that kids love! OMG this was so amazing!! We ended up doubling the dressing recipe and ate seconds. We skipped the bacon (diet). I would totally make this again. Thank you. So glad you enjoyed!! One of my all time favorite salads! Prepping this for “Friendsgiving” tomorrow night. Can the dressing be refrigerated the night before? Usually I’ve not had problem. I used olive oil (not EVOO). Last time I refrigerated dressing with EVOO (I believe) it hardened… so weird. I’m excited for this fall salad and I hope it tastes as good as yours! Also I found an easy candied pecan (stove top) recipe to add a little extra sweetness! Hi Sarah! I have made and stored this vinaigrette in my fridge with no issues before. I’ve never had one harden..maybe there was something else in that one?? But definitely make the dressing ahead of time and just give it a shake or stir before using. I leave off the cheese and bacon but I add honey/mustard chicken breast to the salad for my protein. Do the calories listed include the dressing? Yes, the dressing is included in nutrition information.